Belize is internationally known as an exotic vacation destination, but over the years have been growing in popularity among business travelers. Some international companies are looking for a safe, affordable and accessible country to host their next conference or retreat and because of its year-round great weather, fun tours and unique location, Belize often tops the list. Belize is a short 2-hour flight from many major airports in the United States, and happens to have the only predominantly English speaking population in Central America. This makes setting up a meeting or conference quite easy for those looking for a venue in this area. Once you’ve decided on Belize as your location, the next step is to find a suitable venue that can accommodate your conference size and meet other requirements. 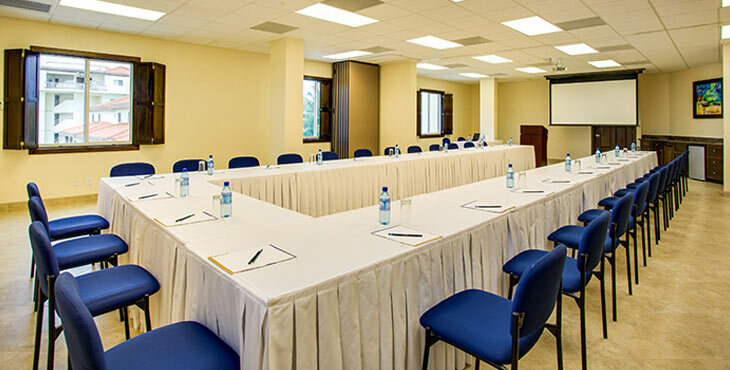 Whether you want views of the pristine beach and azure Caribbean waters, or you want to be close to exciting jungle adventures, there are Belize meeting rooms that meet and exceed your conference needs. Located on the biggest island in Belize, Grand Caribe is an impressive 5-star resort and coveted winner of multiple TripAdvisor awards. The Ambergris Caye resort offers posh accommodations, first class amenities and breath-taking oceanfront views making it one of the primer locations for a conference or meeting. The private condos provide all the facilities necessary to feel at home, including a full kitchen and queen size beds. The on-site full service restaurant, fitness center and multiple swimming pools are just some of the on-site amenities that will make your Belize meeting feel like a luxury vacation. The state-of-the-art conference facility at Grand Caribe is nearly 1300 sq. feet and can comfortably accommodate up to 80 people. A dedicated concierge staff is always equipped and willing to handle any requests you might have. The space can be altered to suit the specific needs of your group whether you’re having a meeting, retreat, or social event. Moreover, with easy access to exciting diving, snorkeling and fishing adventures Grand Caribe Resort is an ideal choice for a Belize conference center. Winner of both TripAdvisor Hotel and Restaurant of the Year awards in 2016, San Ignacio Resort Hotel is an exquisite luxury resort alongside the majestic Macal River. This sophisticated jungle hotel is centrally located in San Ignacio and is walking distance to the town. The unique flare of San Ignacio Resort Hotel coupled with exotic jungle views, lavish accommodations and top rated amenities make this resort a preferred choice for conferences and meetings. Inside you will find contemporary and Mediterranean style marble columns and floors, an exotic hardwood staircase and Baroque themed Lobby Bar. The resort hotel offers numerous luxury suites with either garden, hillside or rainforest views. All the rooms are decked out with local art and wood furnishings for an added Belizean touch. There is also an on-site restaurant & bar, spa and tennis court which all add to the appeal of having a conference or meeting hosted here. Over 5,500 square feet of space is available in the Belize conference center at San Ignacio Resort Hotel. This space can be rearranged in any way you desire to suit the type of event you’re having. The outdoor pool and formal dining areas can also be utilized for events. Audio & video equipment and high speed internet are available as well to ensure that your meeting runs smoothly. Although these resorts are in different parts of the country, they both have Belize meeting rooms equipped with all the amenities you would need. With access to exceptional tours, comfortable accommodations and scenic views, both are a reminder that business travel does not always have to be tiresome and mundane. Choosing either of these two amazing Belize conference centers can make travelling for business turn out to be an unexpected vacation.